In Texas and Mexico, Chilli con carne would typically be made using diced beef and a blend of 3 or 4 different types of chilli. In the British version we use minced beef, 1 type of chilli ('red'!) and beans, usually red kidney beans. So, not authentic, but very tasty. The base for this chilli is identical to British Spag Bol - in fact whenever I make spaghetti bolonese, I always make double quantity of it to turn into Chilly con Carne later. Peel and chop the onion and sauté gently in a little oil on medium heat for about 5 minutes, until softened. Peel and mince the garlic and add it to the pan. After a minute or two, add the minced beef and break it up into small bits. Keep stirring until the beef is browned all over. If your tomatoes are already chopped, throw them in, otherwise you'll need to chop them. Add the stock, the passata, pepper and basil. Simmer for about 30 minutes. At this point, you have your bolognese sauce. If you want to use some of it for Spag Bol, divide the sauce in half and stick it in the fridge. You can now go ahead and convert the bolonese sauce into chilli, or if you managed to plan ahead, put it in the fridge overnight - the flavour will improve dramatically. If you're using fresh chilli, chop it finely. Remove the seeds if you don't like it too hot. Finely chop the green bell pepper. Heat some oil in a frying pan on medium heat and sauté the pepper and chilli pieces for a few minutes. Add the bol sauce and kidney beans. Peel and grate the carrot and throw that in along with the cocoa powder. Give the sauce a good stir and let it simmer for about half an hour. Taste for seasoning and heat, make any necessary adjustments, and serve with rice or flour tortillas. You might want to sprinkle some chopped spring onion or coriander over it. The video above is from the Keef Cooks YouTube channel. 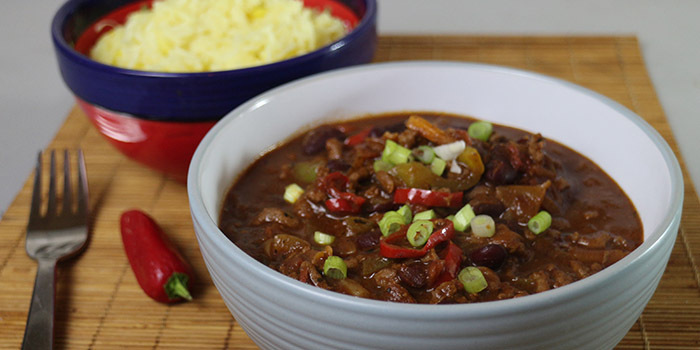 Click here to see the video recipe of Chilli Con Carne on YouTube. If you can't get a red chilli, use dried red chilli flakes. You'll need some vegetable oil for sautéeing, and chopped spring onion or coriander for garnish. Total time: 1 hour 15 minutes. I need to buy film for my camera, help me!